Morgan Miller and Bode Miller on May 7, 2016 in Louisville, Kentucky. The Millers celebrated their first Christmas since the death of their 19-month-old daughter, Emeline. 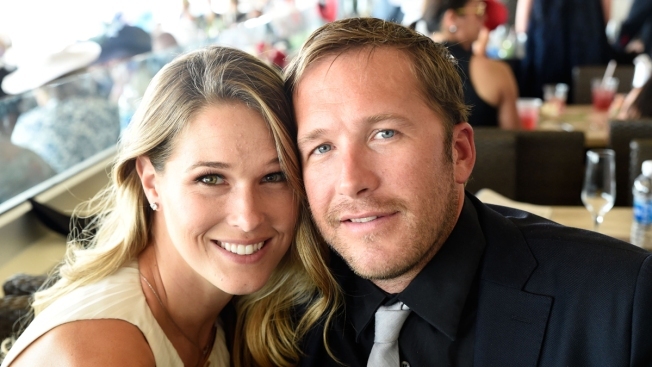 On Christmas day, Bode Miller's wife Morgan Miller posted a series of photos on Instagram to honor her late daughter Emmy Miller. The family photo post came just five months after Emmy died in a tragic drowning accident. The post included a series of photos of the Miller family posing together wearing a matching color scheme. They are seen holding a picture of Emmy in one image. In another picture, 10-year-old daughter Neesyn Miller held a white rose in her hands. Morgan reflected on the year in her Instagram caption about all the ups and downs that 2018 brought. "Merry Christmas to our baby girl in heaven. We miss you so much!" she began. "2018 has been a year full of overwhelming sadness and overwhelming joy. We have spent half of the year mourning and attempting to heal the loss of our angel which feels like an impossible battle all while celebrating the birth of our son," she continued. "Seeking normalcy for our children has been our driving force forward." Merry Christmas to our baby girl in heaven. We miss you so much! ........ 2018 has been a year full of overwhelming sadness and overwhelming joy. We have spent half of the year mourning and attempting to heal the loss of our angel which feels like an impossible battle all while celebrating the birth of our son. Seeking normalcy for our children has been our driving force forward. Normally I would be looking forward to a “fresh beginning” in 2019 but there is no more starting fresh after the loss of a child. So here’s to a healthy 2019 full of personal growth and creating many memories with my babies, full of smiles and laughs. Wishing everyone a special holiday season surrounded by loved ones. She then went on to explain why a "fresh beginning" in 2019 is out of the question. "There is no more starting fresh after the loss of a child," she explained. Morgan concluded, "So here's to a healthy 2019 full of personal growth and creating many memories with my babies, full of smiles and laughs. Wishing everyone a special holiday season surrounded by loved ones." The Olympic skier and his family shared they were heartbroken following their daughter's sudden and tragic death on July 10. Bode wrote at the time, "Never in a million years did we think we would experience a pain like this. Her love, her light, her spirit will never be forgotten. Our little girl loved life and lived it to it's fullest everyday. Our family respectfully requests privacy during this painful time." She was 19-months-old at the time. Three months after Emmy's death, Morgan gave birth to a baby boy named Easton Vaughn Rek Miller. The parents have three other children as well: Neesyn, Samuel Miller, 5, and Nash Miller, 3. Bode told Savannah Guthrie in October, "If there's one thing that can kind of help to heal and fill that spot in your heart, it's a baby and he's a special one."